Yesterday was my mom's birthday, so today I baked her pumpkin muffins (chocolate chip, walnut, and plain) and gave her a birthday present (shh! its a salad spinner). I'd offer a recipe for the muffins but lets be serious, I got a box of Trader Joe's Pumpkin Muffin Mix and added the toppings. I was too tired to make them from scratch. Also, because its rainy and cold I bundled up in my coziest skirt and sweater. 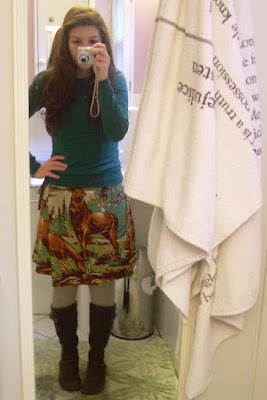 i love the deer skirt!